Governor of Ohio, John Kasich met with Saint Anselm students at a luncheon in the New Hampshire Institute of Politics on Nov. 15. Kasich was elected as Ohio’s governor in 2010, and was re-elected in 2014. He well known nationwide for running in the Republican Presidential primary in 2016, against Ted Cruz, Marco Rubio, and Donald Trump, among others. He was the last Republican candidate to suspend his campaign, ceding to current President Donald Trump. Kasich’s visit to New Hampshire has sparked questions of his political future. His term as governor will end in January, and he will not be able to run again due to his term limit. Historically, candidates have often come to New Hampshire before announcing a presidential campaign, which has lead many to believe Kasich’s visit may hint at a 2020 presidential campaign. 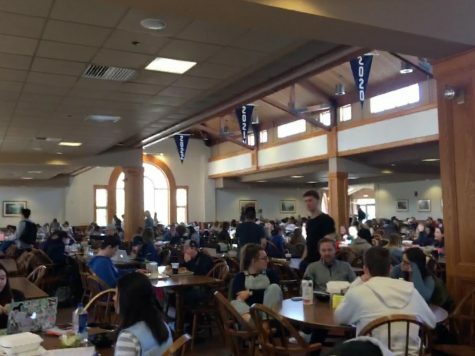 Saint Anselm students responded to these campaign assumptions at the luncheon. Once Kasich opened the floor up to student questions, sophomore politics major David Micali immediately asked, “Are you planning on running in 2020?” to which the audience erupted in laughter. He followed this statement by saying, “What I don’t want to do is to go back into it again and then diminish my voice,” referring to his 2016 loss. Despite quickly shutting down campaign rumours, his following comments hinted at the potential for a future race. Junior politics major Christian Damian asked the governor if he thought an independent candidate could win a presidential race in her lifetime. Kasich turned the general question toward himself, and spoke of the many Democrats who tell him that they “like” him, despite the fact that he is Republican. Kasich also expressed his excitement regarding the recent midterm elections. He said, “The public has rejected victimization and name calling that we see. People have been saying ‘I’ve had enough of what I’m hearing.’” Kasich alluded to the country’s leadership under Trump and has been a known critic of the President. He also stated that he found the results of the midterm elections to be very encouraging for the country. Kasich’s visit to the college was one of three public appearances he made over a two day span in New Hampshire. On Nov 14, Kasich attended a private dinner with supporters from his 2016 campaign. In addition to Thursday’s luncheon, he attended a media event with press and supporters at the office of former New Hampshire Attorney General, Thomas Rath. That night, he spoke at the Nackey S. Loeb School of Communication’s First Amendment event held at the Palace Theater in Manchester. According to the school’s website, the event recognizes New Hampshire residents and organizations who work to protect the First Amendment’s right to free speech and free press. Kasich echoed the First Amendment event’s ideals in his remarks to Saint Anselm College students. Upon first entering the West Wing filled with around 30 students and faculty members, Kasich reflected on the numerous photos of political leaders that lined the halls of NHIOP. While Kasich did not confirm where his political future would lead him, the visit was certainly an exciting opportunity for students.